After a lovely vacation on the beach I am drawn (once again) to creating beachy thing. I think it is my destiny, to one day, to live on the coast. I saw a lovely drift wood orb in Crate and Barrel recently and as soon as humanly possible went to my secret Chicago beach to collect some drift wood, ready to make my own version. 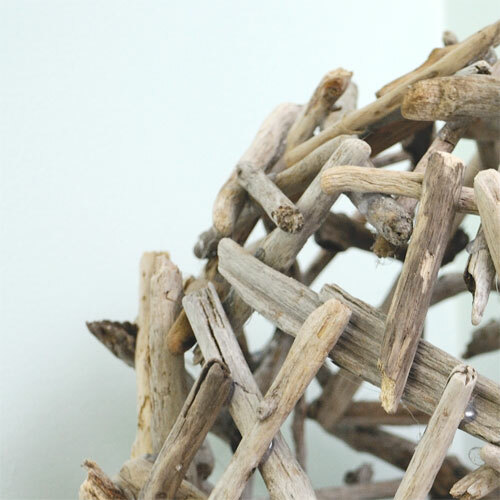 Lake drift wood is just as good as sea drift wood. It took a little patience and did result in quite a few hot glue gun burns but what can I say I should wear gloves! Short lengths of drift wood, get way more than you think you will need. I ran out mid project and my orb sat unfinished in the garages for ages. I did not want to cut any of the wood I collected preferring the natural look of the ends. Hot glue gun with lots of spare glue sticks. Blow up the beach ball. 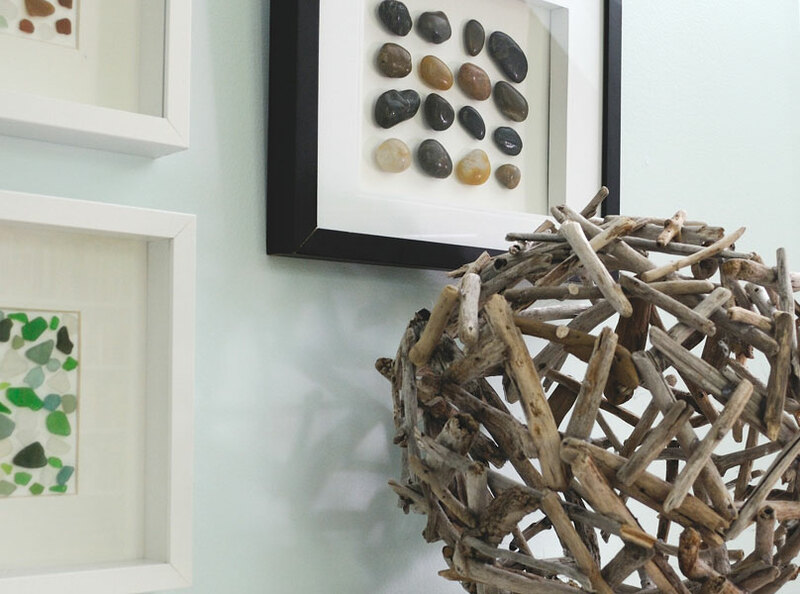 Working from the top down create a lattice work of drift wood, hot gluing as you go. The easiest way is to build the basic structure first and infill with smaller pieces as you go. Once the ball is totally encased in wood deflate and remove. This entry was posted in Coastal Crafts, Coastal Decor, Craft Projects, Decorative Accents, Home Decor, Natural Materials, Trash to Treasure, Wood. Bookmark the permalink. Great idea! Can I link back to you on my blog using your pictures? I love it! Like, really love it. And I agree – lake driftwood IS just as good. sure as long as you credit me! Lake driftwood is surprisingly good…although my last two trip to my secret beach have been fraught with issues. I got my first ever parking ticket then I managed to leave my purse, phone, ID driving license etc in my bag…in the garage! How can a deflated ball be removed once hot gun glue is used on it? 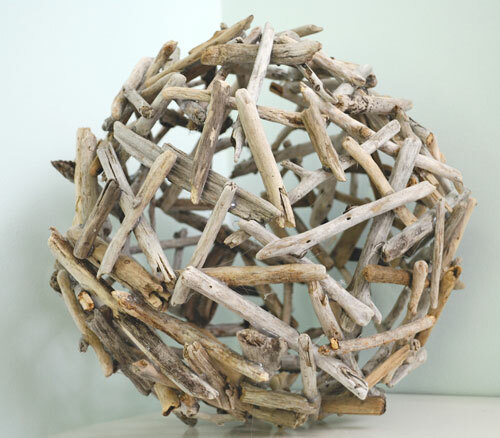 I love driftwood and beach creations too. 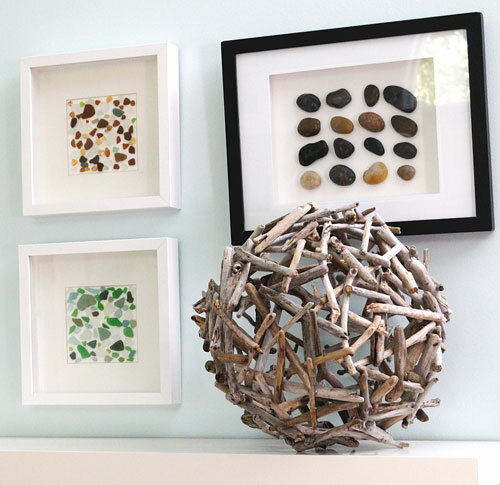 There is something really invigorating about having images in your home that remind you of being at the beach. Thanks for sharing this tutorial. I would love to try it one day. Great! Never though of using the ball.. Thanx for the tip! Did you poke holes in the ball to get it out or was it still usable after you were done? Love it! Absolutely an awesome beach house decoration! Did you do anything to clean the driftwood first? Thanks Leslie, I didn't do anything to clean the driftwood…but it was lake driftwood as opposed to sea driftwood so there were no salt issues. It is very nice. I want to try making one ,thanks for sharing. Do you think i can sell it. That is really cool. 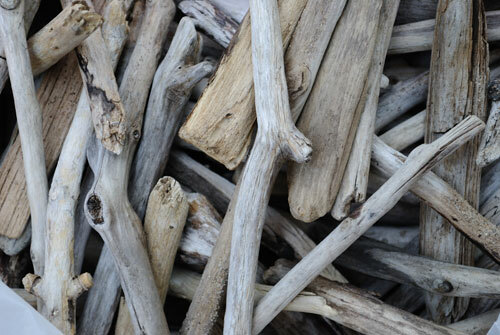 I have some driftwood that I have collected over the years and taking an outer banks vacation this summer. Will have to try this. Thanks for the idea. Pinning! 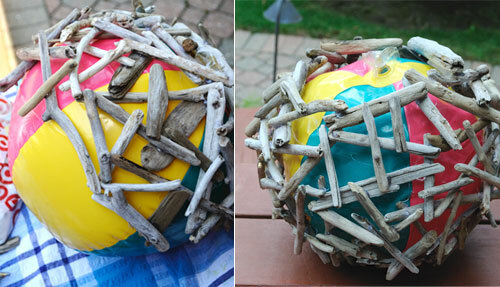 I am going to the beach soon, and I will be loading up on driftwood! Thanks for the idea! Love it! I’m going to try and make this with a Thomas Edison light inside to hang. Hi i tried today and had the project going on good, except when I lifted it up it all fell apart… i think it might be because of the quality of the drift wood. It is from the seaside. Did that happen to anyone who tried before? Sorry to hear your orb fell to pieces. Send me a photo of your orb! Might have re-inspired me with your upcycling! Can’t beat a bit of beach combing… it is a treasure quest! I am having the hardest time finding the hanging lamp part to make it a lamp! I would prefer a stem than cord, and black. I see some of the commercial ones have a hole to change the light on the side and they have complaints about that. A hole on the bottom would work fine and the last part at the top would have to be done after removing the ball/balloon I think. I will keep a look out for anything I think we work. 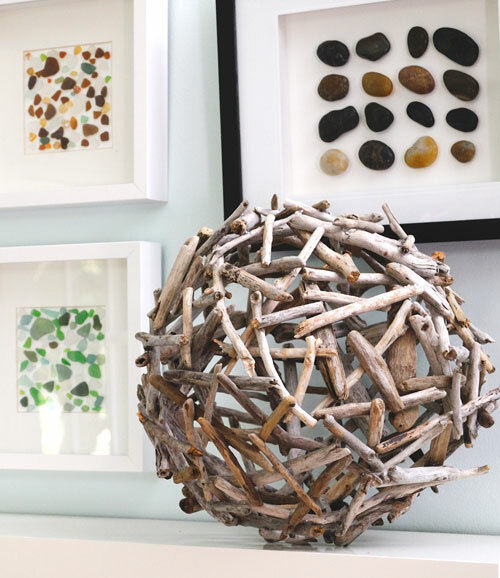 This orb would make a great light fixture!